Born in Brisbane (Australia). Cathy Milliken studied in Australia, majoring in performance (piano and oboe). A founding member of the Ensemble Modern, she has worked with musicians such as György Ligeti, Karlheinz Stockhausen, Pierre Boulez, Fred Frith and Frank Zappa. She also formed HCD Productions with colleagues Dietmar Wiesner and Hermann Kretzschmar. 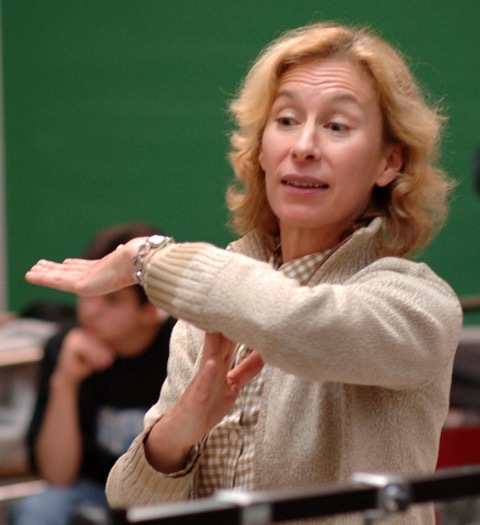 She has composed for concert, opera, radio, film and commissioners include: South Bank Centre London, Staatsoper Berlin and Musica Viva (Symphonieorchester des Bayerischen Rundfunks). International participatory compositions and projects include for Umculo Festival (South Africa), Future Labo (Japan) or Berliner Philharmoniker, Klangspuren Festival and Münchener Biennale. She is recipient of “Prix Italia” with Dietmar Wiesner for “Bunyah”, “Prix Marulic”, “Deutscher Kritikerpreis” and the 2016 Australian Art Music Award for an orchestral work as well as being a finalist for the 2017 Mario Merz award and the Paul Lowin Award for an orchestral composition. She will be Associate Composer of the Adelaide Symphony Orchestra for the Seasons 2018-2020. She lives in Berlin as a free lance composer, performer and creative director and is currently a doctoral student of the Griffith University, Australia. The Australian oboist and composer Cathy Milliken returns to the Darmstadt Summer Course 2018 after a long absence. Her varied experience as a performing musician, composer and teacher brings her on several levels. In addition to her oboe studio, she will enter into various collaborations with other lecturers, including the percussion class of Christian Dierstein and Håkon Stene and Graeme Jennings’s violin studio. A “Call for Oboe, Violin and Composition” will be announced later. One focus of her work in Darmstadt will be the question of collaboration. In a series of three workshops, it will be about the collaborative “making”, which will be played out on the basis of the Song format. Richard Sennett’s thoughts on “Together” play an important role in this project by Cathy Milliken. Again, a call will be published shortly. And finally, the versatile artist will also present her thoughts on collaborative composing in a lecture, be active as an interpreter with a piece by Karen Power and as a composer-performer of her piece “Catalogue of Blue” (for oboe and percussion). When I know the context, I choose the repertoire or performance modus accordingly. Knowing the context is extremely important. Important when curating is to consider the elements – imagine the space, dream the elements in real time as you don’t get a rehearsal – choices and ideas must be right first time. Music has physicality and therefore is in part science, but it goes far beyond this – as drama, as an atlas of sound, as a collaborative act – and much more.